Tower climbing harnesses are built to keep workers comfortable, even after extended hours. ExoFit NEX™ Arc Flash Tower Harness is Arc Flash rated and is designed for all day comfort when your job has the potential for getting hot. 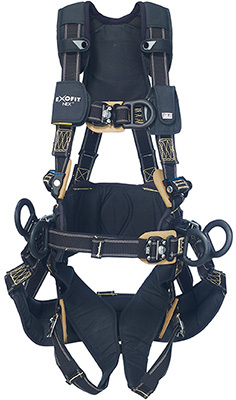 The ExoFit NEX™ ARC FLASH Tower Harness provides the same key features as the ExoFit NEX Tower Harness along with the ASTM Arc Flash rating. Developed in the custom process, this harness has already seen considerable success due to the new OSHA standard change. Flame Resistant Webbing – Nomex® exterior with Kevlar® core and thread provides 7,000 lb. strength and ultimate flame resistance. Revolver™ Vertical Torso Adjusters – Simple and fast adjustments that eliminate loose ends and lock into place, preventing slippage. PVC Coated Tech-Lite™ Aluminum D-Rings – Non-conductive, extremely lightweight aluminum alloy hardware offers the highest level of comfort and security. Flame Resistant Trauma Straps – Provide an adjustable, continuous loop for post fall, minimizing suspension trauma. Stand-Up Dorsal D-Ring – Non-conductive, extremely lightweight PVC-coated aluminum D-ring is spring loaded for fast and easy connections. Arc Flash Rated – Tested to perform in accordance with ASTM F887-11 standard for personal climbing equipment. Arc Flash Hybrid Padding – Lightweight shoulder, hip and leg padding always keeps the wearer comfortable. Molded Lanyard Keepers – Easy holstered lanyard hooks break away to avoid trip hazard. Reflective Material – Integrated on legs, chest, shoulders and back for greater visibility and safety. Built-In Carrying Pocket – Conveniently holds a cell phone, camera or other items. Duo-Lok™ Quick Connect Buckles – Lightweight aluminum, one-handed use with memory fit web lock ensures fast, non-slipping connections.